Yesterday’s announcement that Microsoft will buy Nokia’s smart phone business for $7 Billion, serves to underscore the points made in this post, written before the Microsoft announcement. Speculation that Microsoft might buy Blackberry was wishful thinking at best. Nokia is a much more obvious fit with Microsoft, which adds yet another wrinkle to the mobile market landscape, but is unlikely to have much impact on the current dominant players. Some observers are speculating that as Microsoft enters the mobile device business, it may worsen the prospects for Windows Phone. Time will tell. In a series of earlier posts I have focused on Canada‘s “natural resource curse,” and its effect on government investment in innovation. The “natural resource curse,” is a now well-established economic phenomenon, in which economies that focus heavily on natural resource exploitation typically under perform more diverse economies. Venezuela is a good example. The Harper government has seemed content to focus merely on tax incentives to stimulate innovation, as the info-graphic below shows. The result has been a catastrophe for the Canadian economy, and a precipitous decline in Canadian productivity (which is largely driven by innovation), particularly vis-a-vis the United States. This issue has also been a continuing editorial topic in the media over the last few years, with little or no result. Arvind Gupta, CEO of MITACS, a leading non-profit R&D firm, has argued forcefully that Canadian needs to create an innovation czar, as was done for the “Seize the Podium” initiative for the 2010 Winter Olympics. This has also fallen on deaf ears in Ottawa. A recent article from the Globe & Mail serves as yet another data-point in Canada’s disturbing decline in innovation and productivity. The sale and breakup of a flagship technology company is a reoccurring theme in Canadian business. But this time is different. If BlackBerry Ltd.goes, there is no ready replacement. That’s a telling switch from the situation Canada faced with the sale of Newbridge Networks in 2000 and the demise of Nortel Networks in 2009. More than a decade of declining business investment in research and development has left Canada without an obvious BlackBerry successor. Despite bright spots in Waterloo, Ont., and Ottawa, the country’s performance on most of the important benchmarks of innovation has been deteriorating for years. Blame business. Governments have kept up their end of the bargain by bolstering research funding for firms and universities – to the point that Canada now ranks first among the Group of Seven industrial countries in higher education research. And the number of Canadian science and engineering PhDs has soared in recent years. Yet, R&D performed at the corporate level keeps slipping. From 1.14 per cent of gross domestic product in 2006, private sector spending on R&D declined to 0.89 per cent in 2011. By that measure, Canada fell to 25th from 18th place among the 41 countries measured by the Organization for Economic Co-operation Development. The result is an innovation bottleneck. An abundance of science is generated in university labs and startup firms but most of it never finds its way into commercial applications. Risk-averse banks and too many businesses of the bird-in-the-hand variety remain the weak links in Canada’s innovation system. If Blackberry is sold – as seems likely after the board announced a strategic review and hired investment bankers – it will most likely be carved into pieces. That stands to make Canada’s innovation situation worse. The company, which benefited from government grants and loans in its early days, has given back by nurturing the countless startups for which BlackBerry is a customer or mentor. Nortel played a similar role in its day. The loss of an anchor can compromise an entire ecosystem of innovation, making it even harder for startups to make the leap to commercialization. The next BlackBerry need not be a tech firm. Innovation can be driven by any sector, even the old-economy resource extraction business of the oil sands. But tech firms remain by far the most R&D-intensive players in any economy. Hence, the tech sector is a key barometer of a country’s innovation strength. And innovation matters because it has a profound influence on our living standards – it is “the key long-run driver of productivity and income growth,” the OECD says. Somehow, Canadian business didn’t get the memo. At its peak in 2000, Nortel, the now-defunct Canadian telecommunications equipment maker, spent $6-billion on research, a sum that dropped to $1.67-billion in 2008, just before its bankruptcy. Even then, Nortel remained Canada’s R&D leader. Luckily for Canada, BlackBerry hit its stride before Nortel collapsed. Almost by default, the Waterloo-based firm became Canada’s biggest R&D spender. But even with outlays of $1.54-billion in 2011 – some of which was spent developing its line of BlackBerry 10 phones – its expenditures on R&D were barely a quarter the amount Nortel was spending a decade earlier. 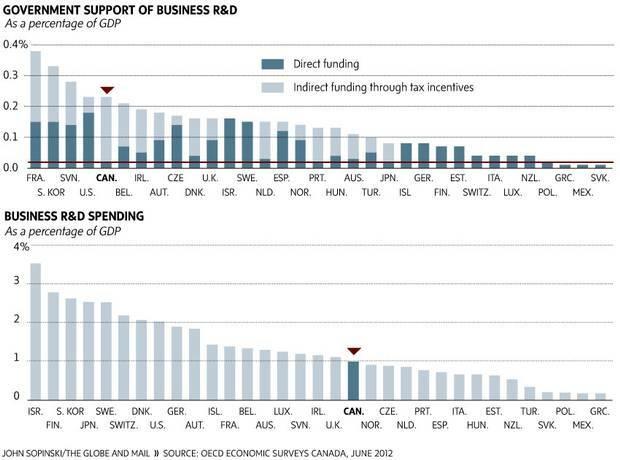 Indeed, overall R&D funding by Canadian firms has fallen in both real and nominal terms in recent years. Canadian companies allocated $14.1-billion for research in 2012, down from $14.9-billion in 2006. Though the recession may partly explain the drop, R&D spending does not appear to have picked up with the recovery. This is not where Canada needs to be in a world in which knowledge-based capital is increasingly supplanting physical capital and labour as the main driver of productivity growth, competitiveness and standards of living. Yet, despite countless warnings, Canadian businesses remain oddly complacent. It’s no coincidence that many of Canada’s greatest entrepreneurs and innovators have been immigrants. Unlike his American counterpart, the average Canadian business graduate does not dream of becoming the next Sergey Brin, Steve Jobs or, for that matter, Peter Munk. Mr. Lazaridis and ex-BlackBerry co-CEO Jim Balsillie notwithstanding, how many Canadian entrepreneurs and innovators have truly changed the world, or aspire? By all accounts, not that many. A Conference Board study released last month found that only 10 per cent of Canadian firms (almost all of them small ones) pursue “radical or revolutionary” innovations. Large firms focus at best on “incremental” innovations. The Paris-based organization zeroed in on the difficulty innovation-driven firms here face in obtaining credit, given the forbidding collateral requirements set by banks and the country’s relatively small venture capital sector. It also noted a higher reliance of Canadian firms on government to “motivate” investments in R&D compared with other countries. And it underscored the weak quality of management in Canada vis-à-vis the United States: “One reason for superior U.S. performance is competition and market discipline. Well-run firms are rewarded more quickly with greater market share, while poorly managed firms are forced to shrink and exit,” the study said. Changing the culture of Canadian business will not be easy. Some argue it may only get harder as the oil sands become the country’s dominant engine of growth. Could Canada revert to its default setting as a resource economy with a bunch of satellite industries focused on servicing the oil sector? The OECD study noted that “resource-rich” countries like Canada and Norway have weaker innovation records than “resource-poor” counterparts such as Israel, South Korea and Japan. “The presence of resource rents might itself dull the drive to innovate,” the report said, by attracting labour and money to extraction businesses that conduct less research. Resource wealth need not be destiny, however. The oil sands employs a slew of scientists and engineers working to improve productivity and reduce the sector’s environmental impact. “The cost of production in the oil sands has come way down in the past 20 years because of innovation,” Mr. Bloom adds. Still, governments could do more to drive innovation in the oil sands by putting a higher price on carbon emissions and setting stricter regulations for restoring land affected by bitumen mining. The payoff would extend beyond the environmental benefits to include the commercialization of new technologies. What more could Ottawa and the provinces do to improve Canada’s innovation performance? That question has led to the felling of entire forests over the years, most recently with the 148-page report tabled by a federally-appointed panel led by Open Text Corp. executive chairman Tom Jenkins. But while the incentives have generated plenty of work for accountants, they have yielded only mediocre innovation results. Based in part on the panel’s recommendations, Ottawa is scaling back tax incentives starting next year, particularly for large companies, and putting more money into direct research grants and vouchers. The latter will enable startup firms to pay universities to conduct research on their behalf and get management advice from business experts. Another major shift is the rewriting of the National Research Council’s mandate, directing it to conduct applied research commissioned by businesses. Big business and academics have roundly criticized the changes. The former argue they will be penalized under the new tax rules, while the latter fear that “pure” research could suffer. But if creating the next BlackBerry (and the next one after that) is the end goal of Canada’s innovation policy, Ottawa appears to be on the right track. ← ZigBee wants to be the Bluetooth of the Internet of Things. Too bad everyone hates it.